“The European Union is made up of 27 Member States who have decided to gradually link together their know-how, resources and destinies. Together, during a period of enlargement of 50 years, they have built a zone of stability, democracy and sustainable development whilst maintaining cultural diversity, tolerance and individual freedoms. The European Union is committed to sharing its achievements and its values with countries and peoples beyond its borders”. The European Commission is the EU’s executive body. "This publication has been produced with the assistance of the European Union. The contents of this publication are the sole responsibility of Center for non-formal education - Triagolnik, Proni Brcko, Forum MNE and ERYICA and can in no way be taken to reflect the views of the European Union." About Center for non-formal education – Triagolnik ................................................................................. TRIAGOLNIK started to implement its model of work in F.Y.R of Macedonia in June 2002 and succeeded to maintain the sustainability of its key programmes such as community youth work, non-formal education on university level, youth participation and youth policy. 2010 was crucial year for the strategic development of TRIAGOLNIK. After a hard work and dedication to practicing, development and acknowledgement of youth work and non-formal education in Republic of Macedonia which is in the line with the EU accession frameworks, TRIAGOLNIK shifted its strategic determination towards becoming resource organization that offers consultant services for capacity building of the civil sector, local authorities, educational and public institutions. The beginnings of TRIAGOLNIK were marked with the implementation of the university course in Leadership and Community Youth Work which have produced competent professionals able to work on the youth development and the community development. This followed with implementation of projects, trainings and workshops in the frameworks of which number of young people were recognized, included and inspired. Further on, we expanded our activities in the major urban and rural areas in our country where we developed the potentials, not only of youth, but of representatives from the civil sector, educational institutions and municipalities as well. We successfully built conditions for mutual partnerships and united efforts in the area of youth development among all social actors. In the same time Triagolnik was recognized as a resource by the relevant institutions in Macedonia and worked on building the capacities of the staff in Children’s home “11 Oktomvri”. What made us different from the others is the application of a model of work that makes long-term changes in the recognition of the youth work and integration of the non-formal education as complementary to the formal. The transfer of the programme in Leadership and Community Youth Work from university course into bachelor degree studies is considered as our biggest accomplishment that will provide ongoing and standardized development of specialized educational profile that will use non-formal education while providing support to the youth development. The inner positive energy for creating changes has motivated us to work constantly on the organizational development of the capacities as well. TRIAGOLNIK, today, have efficient and effective organizational structure, employees who believe in what they do and are prepared to give their best in every challenge. Our enthusiasm and the engaged effort, through all of these years, gave us opportunity to gain confidence and support from variety of strategic and financial partners, and to build stable and sustainable organizations that recognize potentials, build capacities and make changes. In terms of the given trust by the various actors which enabled Triagolnik to share its knowledge and experience, it is important to mention Forum SYD and SIDA who have realized the capacities of Triagolnik and has actively used it to implement its programs in Kosovo as well, then Adoptionscentrum and British Council which supported capacity building of institutions in our country, and with that confirmed that it has internal quality and capacity that need to be used. In regards to the support provided by the European Commission, through the IPA 2009 – Civil Society Facility – Regional Programmes, Triagolnik was able to intensively work with over 30 civil society organizations in the region, by which we think we set positive example for the practice of regional and national cooperation that is crucial for fulfilling the role of the civic sector in representing the voice of citizens and calling the responsibility of state, as one more element necessary for functioning in accordance with the values of European Union. Protection and promotion of human rights, Youth work in the community, Social education, Peace-Building, Inter-sector cooperation, Support youth initiatives, Promoting EU integration. PRONI Center is working on bridging the barriers that create differences within society. We work for individuals and groups in society that will have the benefit of the labor organization with a special focus on young people. We cooperate with all organizations in the NGO sector, institutions, government agencies at all levels within the state, funds and agencies outside of BiH that share the same goals and values as well as individuals who have intellectual and economic potential to support those ideas, goals and values that advocates and the organization. PRONI Center is implementing its peace work education and peace work methodology in the post-war areas where society expressed the need for social reconstruction. PRONI Center currently operates in North-Eastern Bosnia. Advocacy and Lobbying trainings for youth organizations ALTYO project is the first approved project from the EU ALTYO - greatly contributed to PRONI with new experience and new learning about the EU projects, also with overcoming obstacles that we encountered for the first time. ALTYO contributed to new cross-border cooperation between PRONI and Forum MNE and TRIAGOLNIK, but also include the national cooperation, with NGOs and with local and national government. Several organizations from B&H through ALTYO project had the opportunity for the first time to get acquainted with the EU project, what they highly value. About Forum MNE – Forum mladi i neformalna edukacija ...................................................................................... Forum MNE is an organization working in Montenegro since 2002. towards the realisation of its vision: ...A peaceful and just society with young active citizens contributing to its development... by providing support to the development of young people into conscious, responsible and active citizens and individuals. Forum MNE enables them to recognise, demand and realise their rights and contribute to development of a peaceful and just society. We develop and realise programmes based on non-formal education, with a specific focus on community youth work and volunteerism, we promote children and youth rights, youth creativity and youth activism. We support development and implementation of youth policy as well as creation of the law related to youth issues in cooperation with all relevant stakeholders in the society. Forum MNE programmes are based on the principles and values of: non-discrimination, life-long learning, promoting and taking personal responsibility, proactivity, respecting and valuing youth and active participation of youth in decision making processes. In cooperation between Forum MNE, Faculty of Philosophy/Nikšić and School for Education and Communication/Jönköping, the elective studies on ‘Leadership and CYW’’ has been accredited by the Faculty of Philosophy and Ministry of Education and Science (MES). Tempus program is continuation of these activities and it envisaged introducing BA program in youth work. Currently the Faculty is working on development of MA program with a support of Forum MNE. Forum MNE has excellent partnerships with governmental institutions, both on local and national level. Besides, Forum MNE is active member and has valuable benefits of participation in several international networks (Forum SYD Balkan network, ERYICA, FARE, Anna Lindh, EVS/Youth in Action). On national level, the organization is member of COF (Montenegrin youth forum), DOP (Corporate Social Responsibility), LGBT national movement, RECOM initiative etc. Forum MNE offered cooperation to some NGOs working in the youth field related to partnerships for EC programs. Forum MNE is providing different interventions for capacity building of CSOs and institutions from Montenegro working with young people. The process of capacity building is referring to providing skills and knowledge on advocacy and lobbying on youth issues with great balance between theoretical inputs and providing step by step practice in planning and conducting actions on improving the provision of opportunities for these vulnerable groups. Since this project had the aim to ensure that the capacities of the CSOs are strengthened, rather than the capacities of individuals working in these organizations, along with the education of CSO representatives, mentoring activities were provided for the organizations themselves. By increasing the capacity to use advocacy and lobbing we contributed to incensement of the quality of services done by these CSOs thus ensuring more professionally operating civil society. The education course strengthened CSO capacity for future representative activities: policy awareness, dissemination and analysis of sector relevant information, lobbying and advocacy. Due to the fact that in the country the types of interventions have changed from solving crises to actual developmental projects, the requests from the donors are for sustainable projects that show long-lasting results. 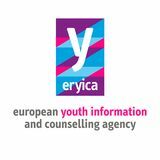 About European Youth Information and Counselling Agency (ERYICA) ..................................................................................... Established in 1986 as an international non-governmental non-profit organisation, the European Youth Information and Counselling Agency (ERYICA) is a European "platform" organisation for national networks of "generalist" youth information centres and services which provide information and other services for young people. At present there are such networks in 25 European countries, composed of around 7,700 centres and points, which receive more than 20 million visits each year and where around 12,500 persons work as youth information workers. ERYICA works to intensify European co-operation in the field of youth information work and services. It aims to develop, support and promote quality generalist youth information policy and practice at all levels, in order to meet the information needs of young people in Europe and to apply the principles of the European Youth Information Charter. The secretariat of the Agency is located in Luxembourg. Since its creation the Agency has co-operated with the Youth Sector of the Council of Europe. It contributed to the elaboration of the Council's Recommendation (90) 7 concerning Information and Counselling for Young People in Europe. ERYICA has also co-operated with the European Union in a number of projects, the last of which being the preparation of the “Youth on the Move Card Initiative” expert group. Many youth information centres that are affiliated to ERYICA in Europe are also members of the European Youth Card Association; moreover, ERYICA cooperates with the Eurodesk network and with the European Youth Forum. Youth information work is now recognised as a part of youth policy in many countries, and ERYICA and its national partners are working on issues relating to minimum standards and quality measures. In 2004, the Agency has updated the European Youth Information Charter, a set of professional principles (originally adopted in 1993) that is widely accepted by those working in this field, and is signed by 41 governmental and non-governmental bodies. Other activities of the Agency include:  co-operation with other European youth networks (at national and European level)  organisation of seminars and working-groups  promoting youth information at the European level  technical assistance missions in countries initiating youth information services. This background links ERYICA to the ALTYO project that supports the three participating partner countries to effectively advocate for the recognition of youth information services, at the same time supporting representatives of youth organisations to enrich their skills. The Western Balkans are a priority area for the Agency that supports the creation and development of youth information services in the region, a commitment that is marked by several events in the region, such as the 19th General Assembly of ERYICA (Kotor, Montenegro), the 22nd General Assembly (Opatija, Croatia) and a seminar in Tivat and Kotor, Montenegro in 2008. Moreover, ERYICA celebrated the 25th anniversary of its foundation with a conference held in Opatija in 2011. The organisation, through two experts of advocacy and lobbying as consultants, designed a training module on the subject, delivered it in all the three countries and provided consultations for participants. Parts of this training and our experience are published in this booklet. The feedback of trainings justified our efforts and we do hope that we could effectively contribute to the development of civil society in the target region of the project. ALTYO – Advocacy and Lobbying Training for Youth Organizations ...................................................................................... Center for non-formal education - TRIAGOLNIK with the partner organizations Forum MNE (Montenegro), PRONI Brcko (Bosnia and Herzegovina) and ERYICA (Luxemburg), from January 2011, started with the implementation of the project ALTYO - Advocacy and Lobbying Training for Youth Organizations, approved by the European Commission in the frame of the IPA 2009 – Civil Society Facility – Regional Programmes, under the "Support to Partnership Actions to Minorities/Vulnerable Groups Organisations". The duration period of the project implementation is 22 months. The purpose of this project was to empower/build the capacities of local youth CSOs in F.Y.R of Macedonia, Montenegro, and Bosnia and Herzegovina in advocacy and lobbying in order to effectively influence local and national policies. The results we were striving to achieve were: 1. Youth CSOs in the three countries have skills and knowledge to actively engage in decision-making processes at national level; 2. Increased knowledge/understanding of youth CSOs with regards to national/European laws and policies concerning youth; 3. Established contacts/networks between youth CSOs at national and regional level; 4. Advocacy actions on youth rights implemented in national partnership between youth CSOs; 5. Increased cross-border cooperation on promotion of youth rights; 6. Increased awareness among general public on relevant youth issues, especially with regards to marginalized groups. 7. Increased communication between public authorities and youth CSOs with regards to relevant youth policies. In order to reach named results, the delivery of this course was foreseen as a crucial activity within the project. The course was planned as a long term course lasting throughout approximately nine months. The course was also including additional 4 months implementation of a practical assignment for practicing the gained skills and knowledge through realization of short projects – advocacy actions. The course was planned in a manner that provided not only sufficient information for advocacy and lobbying but also created opportunity for reflection analysis and provoking changes in participants’ attitude towards their proactive behavior in own communities regarding issues relevant for their work. Since the CSOs are facing lack of understanding of the necessity of institutionalization of the changes they want to see happen, the course provided time and experience for utilization of the gained knowledge. Mainly this was be achieved through the realization of a practical assignment, an advocacy action/campaign. The course was delivered in Former Yugoslav Republic of Macedonia, Bosnia and Herzegovina and Montenegro at the same time. The whole course was delivered in 6 teaching blocks – modules. Within the ALTYO project 63 activists from 32 CSOs, from the region, were included in strengthening their capacity for practicing advocacy and lobbying in order to improve the employment opportunities for the young women, youth with handicap, young Roma and youth in rural areas in Former Yugoslav Republic of Macedonia, Montenegro and Bosnia and Herzegovina. How to plan and run advocacy and lobbying campaign paper knowledge developed on this module was connected with the planned project proposals from module 4. The module was dedicated to achieve not only participantsâ&#x20AC;&#x2122; skill development in writing policy papers but also to put specific focus on quality analysis of the positive and negative aspects of their proposals and to made them able to write a comprehensive and clear recommendations. The written assignment of this module was the participants to write a comprehensive policy paper related to their planned advocacy action for the purposes of the practical work. The written assignment was done in teams for practical placement. Module 6: Public relations and social marketing The sixth module of this course was dedicated to the topic Public relations & social marketing including the media. This module provided one more key point while organizing advocacy actions which was the communication with the public. The module strived for higher understanding on the PR relations and the benefits of proper media use during advocacy actions. The module content focused on understanding the use of social marketing and accordingly having the skills to create a message that will reach the aims concerning the chosen target group or the audience. The written assignment for this module was the participants to create marketing plan for the advocacy action as planned for the practical placement. The written assignment was done in teams for practical placement. Practical placements After the successful implementation of modules the participants were given an opportunity to implement their planned practical placement for the course in form of advocacy actions. The practical placements were implemented in teams. Overall in all three countries there was implemented 1 advocacy action per 1 vulnerable group (youth with handicap, youth from rural areas, young women, youth without parents and young Roma). The effects from these advocacy actions did not only remain regarding these vulnerable youth, but also stressed the lack of adequate policies or body of law for young people in these 3 countries in general. Through the realization of these actions we have increased the understanding of the use of these tools by the CSOs and initiated practicing a sustainable approach towards achieving societal changes with the use of the advocacy and lobbying as mechanisms. This will increase CSOsâ&#x20AC;&#x2122; capacities and through achieving some societal changes, their overall image and position in the communities they are active in will gradually start to change. In the long run, CSOs will be recognized as relevant representatives of the young people in the society and as key actors in the decision making processes on national level. METHODOLOGY All modules were delivered through non-formal methodology where a balance between theory and practice was achieved. The Course recognized that there are a number of ways in which people learn. The Course reflected some of these ways and included: individual work, small group work, practical work, recordings, written assignments, self assessment, role plays, literature reviews, tutorials, discussions, exercises, activities, simulation games, energizers, observations. The main approach in the course modules was the experiential learning. With such approach, the courses were taught using the experience of the participants and of the tutors in an exploratory manner to look at skills, attitudes and the acquisition of knowledge. Similarly practice was explored to extract learning and improve skills and intervention. Aside of the module lectures and practical work, each participant received individual support sessions after each delivered module in order to receive additional support or use time for consulting on relevant matters from the course. During the delivery of the practical placement of the course, group mentoring sessions were also provided for further support and motivation. What is advocacy and lobbying in civil society ...................................................................................... By the general definition of the term, advocacy is a political process by an individual or a large group that normally aims to influence public policy and resource allocation decisions within political, economic, and social systems and institutions. It may be motivated from moral, ethical or faith principles or simply to protect an asset of interest. Advocacy can include many activities that a person or organisation undertakes including media campaigns, public speaking or commissioning and publishing a research or poll. Lobbying is a form of advocacy where a direct approach is made to legislators on an issue which plays a significant role in modern politics. We comprehend the nature and purpose of advocacy and lobbying activities as a crucial aspect of involvement of the non-profit/civil sector in the decision making processes on societal level Advocacy and lobbying in civil society The above described terms may need some adjustment to better fit the sphere of civil society, as well as civil society representatives need to possess in-depth information to succeed in their advocacy or lobbying actions. This chapter gives a general overview of the above concepts from a field-specific point of view. Through the next pages we will provide some information that civil society representatives need to know before designing and carrying out effective advocacy and lobbying actions, as well as we intend to create a base of fundamental skills in advocacy and lobbying that can be further developed through practice and experience. Defining the problem that requires a policy action. Importantly we are here defining a broader field, where we want change, such as youth unemployment, gender equality etc. As you will be the messenger it is important that you have experience in this issue and like this gives an increased legitimacy to the message. If not it might be a good idea to bring in a partner to the campaign with experience in the field. Defining the policy makers you are addressing. Very often there are several target audiences, making it important to limit the number of audiences targeted as much as possible, again to be SMART. It is also possible to prioritize among the targeted audiences in order to focus the campaign right. For example often the beneficiaries will be targeted with information campaigning inside the advocacy campaign even if the focus of a advocacy campaign would be the decision makers. Tailoring efficient messages to different audiences. Important is that the message is not a slogan or a PR tool but a clear description of what you want to achieved trough the advocacy; in particular formulating a solution you propose to the decision makers and describing the actions that need to be taken. When developing the message it is important to consider how it will be received by the audience. For example a positive solution, something a politician can support and gain popularity by supporting, is often more efficient then a negative message that simply criticizes something. Successful advocacy can show the audience how they would benefit from the proposed solution. While formulating the message it is therefore important to analyze how each of the target audiences can benefit, and consequently adapt the message to each audience. Often economical arguments as well as re-election motivation are important factors to affect politicians. For example “Establishing a youth centre will decrease youth crime as well as school droppouts”. Developing the tools used to deliver the message. Typically a variety of tools will be used such as promotion materials, presswork, meetings, conferences, demand letters etc. Whereas the previous steps will probably only be done in a initial stage this step will continue continuous throughout the campaign as opportunities arise and conditions change. When planning the channels of communication or activities of the campaign it is important to realistically assess the available human and financial resources of the organization. Many advocacy actions do not involve much financial resources and it is possible to implement a zero budget advocacy campaign successfully if focusing the available human resources right and where they are most efficiently used. It might be useful to conduct a SWOT (Strengths, Weaknesses, Opportunities, Threats) analysis of the organization as a advocacy campaigner in order to optimize the campaign. As the channels of communication are identified it is important to draw up an action plan including all timelines as well as deadlines for the different activities that are to be implemented inside the campaign. Activities might depend on each other and there has to be a realistic timeline. Here also the length of the campaign should be considered. Preferably an advocacy campaign should not be longer then 6-12 months as it then loses its momentum. In the action plan activities can also be matched up with political or symbolic events that can give the message increase strength. For example making the activity coincide with the “The day of Youth”, the signing of a bill or declaration in parliament or the like will increase the communication potential of the activity. A good example of symbolism in advocacy is a one-day action about free travel and work in front of the EU Council building in Brussels (and simultaneously in 25 European cities). Building alliances with other groups, organizations or individuals that are supporting the same issue. Try to identify all groups and structures that would benefit from your advocacy goal. The more structures that stand behind the demand the greater legitimacy it will have and the more opportunities for advocacy will be created. There are different ways to include the potential partners. For example;  Inform the structures about your advocacy campaign and invite them to engage themselves in the same issue  Invite the structures to become partners to your campaign. This can be done either as “equal partners” in defining and implementing the campaign or as partners that support your campaign without taking own action.  Formulate a demand letter or a joint article and have it signed by several structures to show the broad support for the issue. Especially it is effectual to involve youth wings of all political partners.  Get academics or expert to speak on your behalf or support your campaign. Identifying and securing financial, human or in kind support for the advocacy campaign. In particular it can be useful to ask for support in terms of printing material by companies, institutions or the like that support/benefit of the issue. Carrying out the planned activities to achieve the advocacy objective. Implementation of a advocacy plan is never static and always have to adapt to political developments and opportunities that arises to communicate the issue. It is important to integrate the campaign in as many of the organizations activities as possible to increase the visibility as well as increase the identification of the campaign together with the organization. For example the message of the campaign can be added to just about any public appearance of the organization in order to spread the message. Is there any data (proved) to illustrate that the objective will improve the situation? Is the objective achievable? Will it be supported by other civil society organizations? Will the objective gain the support of many people? Do people care about the objective strong enough to take the action? Will you be able to raise resources/money to support your work on the objective? Can you clearly identify the target decision makers? What are their positions or names? Is the objective easy to understand? Does the advocacy objective have a clear time frame? Is it realistic? Do you have the necessary alliances with key individuals or organizations to reach your advocacy objective? How will the objective help build alliances with other NGOs, leaders, or stakeholders? Will working on the advocacy objective provide people with opportunities to learn about and become involved with the decision-making process? Usually a mix of tools is used, each with a specific target audience. It is more efficient to use several tools which are specifically designed for a specific target group then to design all tools to be somewhat attractive to several target audiences. It is also important to consider which the more efficient tools are, considering monetary and human resources. For example a few indirect advocacy meetings with the right decision makers will have a stronger political output then a large online campaigns or a festival, which will mainly target the general public. At the same time it is good to be able to tell decision makers that you have collected 10 000 signatures or Facebook members to show the general interest in the issue. In sum; try to find a good balance and always include tools that reach decision makers directly. Effective Advocacy Among so many promoters of so many different goals, advocacy actions need to be welltargeted, effective and easy to remember. To ensure the competitive advantage of your campaign, creativity is very much needed. Below you find a few questions to consider and to brainstorm so as to come up with a recognisable advocacy action. Ideas for brainstorming:  Who are examples of famous people who could support you in public?  In what ways can you do an advocacy campaign on Facebook? (Give examples)  “We demand more than youth participation!” How can you symbolise this in front of a government building?  We demand non-discrimination in education. What do we fax to the Ministry of Education to demand this?  There are elections next month and you need more funding for your activities. How do you pressure the government?  You want to collect signatures for a petition. Where do you go?  You need to speak to the Minister of Education. Where do you meet him/her?  You are at a party congress and you have only pen and paper. How do you voice your demand?  You get a meeting with a minister. How do you make him/her remember you?  How do you get in the media? Use creative ways. How to plan and run advocacy and lobbying campaign Networking and alliances Another way of making your advocacy and lobbying actions more effective is to cooperate and join forces. How does networking work in advocacy? Definitions: Networking is a process of developing and maintaining quality relationships in order to empower you to reach your goals. Alliance is an agreement of two or more parties in order to achieve common goals and secure interest. Why network? Networking provides multiple directions to go with your action. More partners also mean a bigger platform of interest and means more possible sources to cover costs. As members of a network are necessarily somewhat different, even if they work for the same aims, they evoke the more possibilities. Not only costs but responsibilities, contact lists, information and knowledge can be shared. Members of a network can provide mutual visibility for each other and the common goal as well. Last but not least, the simple existence of a network emphasizes the importance of the target. Having allies and acting together multiplies the impact of the action. For example, the Young European Federalists covered the mouth of public statues in the frame of their ‘Belarus Action’ following the last presidential elections in Belarus, stating ‘give a voice to the citizens of Belarus!’ The action intended to raise public attention about controversies in the country and matches all above discussed criteria of a successful advocacy action: simple but original, raises interest, carried out in a good momentum, not complicated to realise, easy to remember, uses easy-to-understand symbolism, interesting for the media - just to mention a few. However, the fact that members of the network carried out the same action at the same time in 125(!) cities worldwide, meant a tremendous multiplier effect for its impact. When considering the benefits of networking, we have to notice that this strengthening effect is mutual: not only an action carried out in partnership has bigger impact but also the network and its members, realising a joint effort, raise their own recognition. How to build a network? Get informed about relevant possibilities. Something that seems unrealistic or irrelevant at first can provide the much needed distinctive character. Answer the following questions about each possible stakeholder: o Which partners do we involve? o What is their influence? o When do they need to be involved? At what stage of the action? Contact the possible partners. To seem professional, you can consider using some techniques mentioned above. Be attractive and show your strengths. Raise the interest of the possible partner to get their attention and cooperation. Keep your contact and pay attention to good communication methods. Find out their opinions, ideas, possibilities and resources, and take these into account when formulating your message. First of all, you need to identify common interest that serves as a leitmotif for the selection of parties. Identify the common resources and possibilities. Prepare an action plan. Implement it. Ensure follow up. Recommended literature: Advocacy: Building Skills for NGO Leaders (The CEDPA Training Manual Series, Volume IX. www.cedpa.org) Information Right Now! Campaign Toolkit - International campaign on youth’s right to information (ERYICA, 2012) A Toolkit for Environmental Advocacy in Africa (Environmental Law Institute, 2004, www.eli.org) Jerningan, D.H.; Wright, P. (1996). "Media advocacy: lessons from community experiences". Journal of Public Health Policy 17 Young, L.; Everitt, J. (2004). Advocacy groups. Vancouver, BC: University of British Columbia Press. “Employment for all” ...................................................................................... “Employment for all” is an advocacy campaign organized by Open the windows, with their representatives Margarita Gulevska, Magdalena Dimkova and Radmila Stojkovska Aleksova; Polioplus, with their representative Maja Kojceva, and Alliance of students and youth with handicap, with their representatives Daniela Stojanovska and Suzana Najdoska, aiming to complement the National action plan for employment with proposed changes and supplements that refer to the youth with handicap. Context Securing the economical independency is one of the most important matters for every adult individual; it provides accomplishments of the human freedoms and needs, self-realization, gaining self-confidence and personal development. The right to work in all of the developed countries represents one of the elementary human rights that do not exclude people with handicap. The issue of employment of the youth with handicap in our country is stated in the lower parts of the state agenda. One of the documents that address this issue is the National action plan for employment 2011-2013, produced by the Ministry of labour and social policies in 2011. Its directions and measures refer to all of the citizens, but it does not contain precise mechanisms for facilitating the process of employment for the people with handicap. Taking this document into consideration, as one of the important tools for initiating employment among the youth, the upper mentioned 3 organizations have decided to work on creation of alterations and supplements that will enforce implementation of mechanisms that will ensure easier employment among the youth with handicap in the open labour market. In order to accomplish this result, the organizations have decided to organize a campaign under the motto “ Employment for all” with the aims:  to increase the awareness of the youth with handicap for the benefits of the employment  to complement the National action plan for employment with proposed changes and supplements that refer to the youth with handicap Interventions undertaken and results achieved In order to accomplish the aim of the campaign, one of the first activities done by the organizations was to initiate meetings with the relevant authorities, Ministry for labour and social policies, in order to form a working group for producing a document, proposal for alteration and supplementing of the National action plan for employment 2011-2013. As a result, a working group was made consisted out of representatives from the three partner organizations and representatives from the Labor sector in the Ministry for labour and social policies. During the campaign there were made 6 working meetings for the creation of the recommendations. At the end, the produced proposal along with the official request for adopting it was sent to the Labor sector, responsible for alteration of the National action plan for employment. Short summary of the proposed alteration and supplements of the National action plan for employment: The alterations and supplements of the National action plan were made in the aspects of specifying concrete mechanisms that will ease the access of information and the use of the employment and self-employment measures by the people with handicap. In the framework of the Direction 6: Making the business climate better and strengthening the competitiveness, there were proposed supplements for inclusion of the protective companies that are employing people with handicap in the specific measures/projects. How to plan and run advocacy and lobbying campaign Ministry Of Education, and encouraged the organizations to collect data of people who haven’t finished secondary school and have it sent to them, since the Ministry has been interested for a long time to put closure on this problem. He stated that the recommendations of the panel discussion and the data base might just be the incentive that the Ministry needed. In addition, the director of the secondary school “Cvetan Dimov” towards the end of the discussion pointed out that he is personally going to make sure that in the following school year two people who haven’t finished secondary school will have an opportunity to be trained and get a diploma in the school he operates (according to a project model that was implemented in municipality Arachinovo). This, he stated, should serve as an incentive to other schools and government institutions to finally include these people in the education system. The panel discussion brought the following recommendations:  more attention should be paid to education, less to mechanisms of sanctions  efforts must be done so that this issue is not treated on a project level, but on an institutional level  constant work meetings should be organized with the relevant institutions for solving this issue; the collaboration between the civil sector and the institutions must continue; changes should be demanded, the civil sector and the institutions must not stagnate. __________________________________________________________________ “This campaign was much needed, because these people are marginalized and stigmatized. They must be introduced again into the educational system. Our assessment is that the campaign was very successful. We put forth an issue that has been neglected for a long time now. With the workshops we succeeded to collect data of the people about what challenges and obstacles they faced. The representatives from the institutions were very interested about putting this issue in their agendas and were very positive for further cooperation with the civic sector” - Aleksandra Dimovska, representative from the Roma Democratic Development Association - Sonce, Tetovo __________________________________________________________________ In regards to the media relations, the organizations participated on several TV stations. They have participated on the morning show on Alfa TV. In addition, the panel discussion was covered by the television 24Vesti. In terms of radios, they were guest on the Macedonian and the Turkish radio. In addition, they published the advocacy and lobbying activities continuously on the facebook profile made for this matter. In the framework of this campaign they have also created promotional flayers containing the issue they are tackling with the campaign and the demand requested from the relevant institutions. Association of citizens “Irhom Topaana” – their main aim is to promote the education of Roma children and their easier integration in the society. Education is one of the most important mechanisms for realization of the individual’s rights. Education should be available for everyone on equal terms regardless their ethnicity and gender. As civil society organization which works more than 10 years on the project “Side By Side”, our purpose is to help Roma children who are discriminated. We are helping them by promoting the education and supporting them to integrate into the society. Thought the project till now were involved more than 1000 children which continued their future education. Association for democratic development of Roma people SONCE: Sonce is formed in 1996 as a non formal group for self help to the roma community in Tetovo. One year later, in the summer 1997 Sonce was visited by representatives of Roma Participation Program - RPP, Open Society Institute -OSI . They suggested that SONCE should be formally registered as an organization so they can contribute to their activities. This was done and till know we are function as Center for Roma population in Tetovo. Vision: Sonce is established organization on international and national level which actively contributes to civil integration and equal practice of democratic rights and opportunities for Roma. Mission: Sonce contributes to democratic integration and effective participation of roma’s community in the society through capacity building, direct support and advocacy for the Romas. How to plan and run advocacy and lobbying campaign Children’s Village Skopje and Agency of employment Skopje, for implementation of the active measures for employment of youngsters without parental care. On the official meetings it was discussed the following proposed procedure, contract to be signed between SOS Children’s Village Skopje, National Agency of employment, the potential employer and the youngster actively seeking a job, as a form of a legal on-the-job training; the employer after the training will make decision for the eventual employment of the youngster. This proposal was left to be further analyzed. ________________________________________________________________________ “I like that the campaign addresses the problems that my friends and I face. This issue has to be spoken loud and clear in order to be listened by all the important decision-makers so they can undertake the right actions. Otherwise, change will not happened and those who will lose will be the youth who do not have any future perspective after entering into the 18th year of their life” – young person who use to live in the Children’s home “11 Oktomvri” ________________________________________________________________________ In regards to the media relations, the organizations tried to maintain the communication with the media throughout the campaign. In terms of media coverage on the national televisions, the organizations have been guests on the morning program at TV Sitel. Whereas, media article was broadcasted on the news on TV Sitel, and on Alsat TV in a form of documentary. In terms of promoting the campaign in the newspapers, articles were written in Dnevnik and Utrinski vesnik. The internet portal Bukvar have also written about the campaign progress. In addition, the volunteers have continuously published texts and photos at the facebook profile: “What now? What then?” INTERCULTURA is organization for cultural support, established in 1997 and officaly registered in 1998. At the moment, we are active locally and nationally, in the same time operating internationally too. Our main goal is to promote youth work through non-formal education, as well as promotion of the culture of all the ethnic communities that live in our country through active participation of youth in the decision-making processes on local and national level; intercultural dialog nationally and internationally; inter-religious dialog; saving energy and lowering the effects of the climate changes; tolerance and non-violent conflict transformation; lowering the unemployment; social integration of youth. Protection of children rights in a non-profit, non-governmental, volunteering organization established in 1998. Our priorities are implementation of the United nations convention for the children rights in the framework of ours legislatives and securing the respect and protection of the children rights in accordance to the Convention. We implement activities to make the Convention available to every citizen, starting from the youngest. Our main goals are: to raise awareness of the children rights and to secure solidarity toward all children in the world; to support and evaluate the practicing of the children rights in accordance to the international laws, the UN Convention for children rights precisely; to promote and practice effective mechanisms so it can be secured and protected the children’s rights in concrete situations. SOS Children village Macedonia is part of the biggest family of the international organization SOS Kinderdorf. There are SOS Children villages in 132 countries in the world and in its 60 years existence they secure long-term care for the children who are in need. SOS Children village Macedonia is association of citizens established in November 2000. The main goal of the organization is care of children without parents and parental care and prevention of children in risk to live without their biological parents. Our vision is that every child belongs to a family and grows in love, respect and security. Our mission is to build families for children in risk, to help them to form their future, and to participate in building of their communities. We take actions, we keep our promises, we believe in one another and we are responsible partners with lasting values while we are working on accomplishing our mission. Initiative for creating mechanisms for continuously raising the awareness of young women in terms of recognizing, preventing and protection from sexual harassment during the employment and at the workplace ........................................................................................................ It is an advocacy campaign organized by the Humanitarian associattion - Majka, with their representatives Lendita Ajdini and Margarita Avramovska; and Derja, with their representatives Kristina Miloshova, and Erdal Musli, aiming to improve the implementation of the law for prevention and protection from discrimination and to provoke changes in the framework of it in order for the problem of sexual harassment to be defined more specifically, especially in terms of defining the types of behavior practiced by the employer that can be considered as sexual harassment. Context The organizations have decided to work on this sensitive issue because in informal conversation and anonymous interviews they have encountered with met many young women between 16-35 years that in the process of their employment they were facing with sexual harassment and refused to accept the job under that kind of circumstances. One of the reasons why this problem exists is because the people are not familiar with the Law for prevention and protection from discrimination. In addition, the sexual harassment is not defined specifically in the legislatives; especially there are not concretely specified the types of the behavior practiced by the employer that can be considered as sexual harassment. The organizations have stated that they are aware that the alteration of the legislative regarding this sensitive issue can be a long process, therefore in the framework of this campaign they are aiming towards just spreading out in the open the need for change that has to be considered by the national authorities. Interventions undertaken and results achieved In the first stage of the camping there were organized focus groups in Skopje and in Kumanovo, attended by young women from 16 to 28 years during which the organizations developed a discussion in which the participants detailed their experiences and also discussed about the legislation on sexual harassment. They also gave some suggestions for the improvement of the situation such as, more detailed definition of the term sexual harassment in the law for easier understanding of it; public TV promotion of the Law on prevention and protection from discrimination, and promotion of the role of the Commission for equal opportunities for women. These suggestions were presented on the round tables held later on in Skopje and Kumanovo. In the second stage of the campaign, working meetings were held with the relevant representatives (Mr. Dushko Minovski, president of the Committee for national strategy on violence, Mrs. Hatidje Topali, president of the Committee on equal opportunities of the municipality of Chair) to talk about the legislation for sexual harassment, the state of the labor market and to invite them to participate in the upcoming round table. They agreed that this issue it is needed to be discussed, and especially to promote more the Law on protection and prevention of discrimination which is a relatively new. The round table in Skopje was held on the 13th of July 2012, at the premises of the Association of the Turkish organizations in Macedonia â&#x20AC;&#x153;Matusitebâ&#x20AC;?. The round table was attended by a representative from the Ministry of labour and social policies, Mr. Dushko Minovski, president of the Commission for national strategy on violence, Mrs. Hatidje Topali, the president of the Commission on Equal Opportunities of municipality of Chair, representatives from other civil society organizations working on this field such as Mrs. Divna Zmejkovska from the Syndicate organization on women UNASM, Mrs. Advije Ljatifi from CSO Florens etc. Relevant institutions should conduct education for young women about the existing regulations and existing mechanisms of protection against sexually harassment. To be organized more round tables, broadcasted on the media, during which relevant institutions and the civic sector will take part and debate the issue of sexual harassment during the employment and at the workplace. How to plan and run advocacy and lobbying campaign ________________________________________________________________________ “I salute this initiative taken because you are putting very important issue on the agenda; issue that is very sensitive for opening, but affects all of us“ – a young woman ________________________________________________________________________ The organizations have stated that they perceived this campaign as really needed because it is a problem that is still taboo, but is very present in the process of employment of the young women. The organizations have evaluated the round tables as very effective because the representatives from the relevant institutions in Kumanovo and in Skopje, accepted to participate and also to talk about the problem. The representatives from the Committees on equal opportunities have also stated that they will ensure this issue to be put on the agenda on their next municipality councils, and that they are open for cooperation with the civil society organizations for the further notice. In regards to the media relations, the organizations have managed to promote their advocacy and lobbying actions to the following media. The round table in Kumanovo was broadcasted by the local TV Nova and the national TV Telma. Whereas, the portal Kumanovo news have published articles on the internet. In addition, the organizations have given an interview for the Macedonian radio. The round table in Skopje was broadcasted by the national television MTV 2 and on the news of the Turkish television. The organizations’ representatives also participated in the morning program at the national television MTV 1 for announcing the round table. In addition, information about the progress of the campaign was constantly presented on the organizations’ facebook profiles. Derja is multicultural, non-profit organization for the Turkish women, established in Skopje in 1999 with the purpose of implementing numerous activities in the local municipalities. The main mission is to define the rights (human and minority), the women rights; to respect their voice, to initiate their emancipation and their integration in the society; to secure education on different subjects (medicine and health care, gender, democracy, civil society empowerment, conflict transformation, education etc); to offer support and encouragement to the women in her fight against the family violence. “We dare you!!! Give us the necessary knowledge!” ...................................................................................... “We dare you!!! Give us the necessary knowledge!” – it is an advocacy campaign organized by Center for education and development - CED, with their representative Lazar Gjorgjevski; Alliance of young farmers, with their representatives Eleonora Veljanovska, and Aleksandra Simonovska, and Council for Prevention of Juvenile Delinquency SPPMD, with their representative Ljubica Kocova, aiming to initiate establishing mechanisms by the relevant institutions for informing the youth from rural areas regarding the selfemployment and employment measures. Context One of the biggest problem in our country is that the population in the rural areas gets older and older. 1,2 % of the population in the rural areas are people up to 40 years, in accordance to the official statistics reports. The youth are looking for improvement of the quality of their lives by migrating in the urban areas. As a result, the villages are losing their potentials taking into consideration their clean and healthy environments with great potentials for production of healthy food and development of rural tourism, attractive for the domestic and foreign visitors. The youth need to be informed about all the possibilities offered by the state institutions for the development of business plans in order for their ideas to become a reality. As future entrepreneurs they have the potential to improve the state of the rural areas. Therefore, the upper mentioned organizations have organized campaign to provoke the responsible relevant institutions and rural municipalities to establish mechanisms for informing the youth from rural areas about the employment and self-employment active programs. In addition, their specific request was to be opened informative body in the rural municipalities. Interventions undertaken and results achieved In the preparatory stage of the campaign, the organizations identified the key slogan for advocating and lobbying: “We dare you!!! Give us the necessary knowledge!” Afterwards they started with the development of the promotional materials (posters, flyers and banners) and the production of the videos. The published materials and the video contained the request appointed to the relevant institutions. The flyers were distributed on all of the working meetings, informative panels and press conference held in Tearce, Tetovo, Kavadarci and Skopje. In regards to the videos, they were broadcasted on the local TV stations (TV Kiss and TV Koha) and were posted on the organizational web sites and official facebook profiles. In the second stage, after the organizations made all the preparatory engagements, they started with initiating communication with the municipalities where the organizations operates. In addition, there were organized informative panels and a press conference in order for this issue to be raised out in the open and to receive as much as support as it needs from the public, media and the relevant institutions. On the informative panels organized in the municipalities of Tearce, Kavadarci and Gazi Baba, the youth were able to address their issues to the representatives of the municipalities and ask for valuable solutions that can be undertaken so they can be able to participate in the labour market equally with their peers that live in the urban areas. In regards to the press-conference, it was organized in Tetovo, on the 31st of July, and it was covered by the local media (TV Koha, TV Art, TV Kiss, TV Menada), the national media (TV 24, radio MOF) and the internet portal Yll press. The mayors have saluted the initiative and they expressed their readiness for mutual collaboration in the realization of the proposed activities. They have stated that they will take into consideration these proposals and in the first opportunity they will appoint an official who will be responsible for the matter or open an office for the support for the youth. The organizations are satisfied with the results achieved because they raised the awareness of the relevant institutions, municipalities of Tearce, Kavadarci and Gazi baba, and the Agency for employment, that youth from rural areas have need to be implemented additional mechanisms in their communities in order for them to be more informed about their educational and employment opportunities so they can put their dreams into action. Alliance of young farmers - the network of young farmers is functioning 5 years and through its activities it defends the interest of the young farmer in our country. Our organization regularly works on the development of the leadership and entrepreneurship skills of the young farmers; initiating team work and communication among them; raising the interest for agriculture, and improving the quality of life. How to plan and run advocacy and lobbying campaign Council for Prevention of Juvenile Delinquency - SPPMD was established in 1996 by local intellectualsâ&#x20AC;&#x2122; teachers, judges, doctors and many others who in that time noticed the vast escalation of the phenomenon of juvenile delinquency between the youth on national level. SPPMD through the years have organized and attended many local, national and international events, especially since it became contact point for the Youth in Action program (under the European Commission) in 2005 and gave opportunity to large number of youth from different ethnic and social background to upgrade themselves and the community we live in. All the projects that SPPMD did in the last years were dedicated to youth, most of them directly involving them. We had projects through the years supported by various foreign donators and by the local business sector that gave opportunity to local youth to independently organize and implement youth projects. Center for education and development - CED is non-governmental organization that is functioning in the municipality of Tearce from December 2006. The target group of the organization is youth from 12 to 18 years. Whereas, for the purpose of accomplishing our goals we are involving teachers, parents, other leading civil society organizations and institutions. Based on the strategic plan, CED in the next 3 years have goal to: lower the negative behavior among youth by organizing cultural and sports events; to influence on the protection of the environment through awareness raising activities; and to improve the collaboration between the different ethnic communities that live in the region through their participation in mutual activities. How to plan and run advocacy and lobbying campaign Local authorities supported advocacy campaign planned and implemented by Roma youth. Every result listed in project proposal was successfully accomplished, the assessment of expected results is positive. From the very beginning in order to strengthen the capacity of staff members, the CEM organization works on increasing the professionalism in the organization’s work, in accordance with European standards. The CEM also works on reaching a higher level of quality in the design and implementation of all the programs of the organization. In addition, to attending various forms of professional training, the CEM staff attended the ALTYO educational program. Advocacy and lobbying training for youth organizations has strengthened the CEM’s knowledge about advocacy actions, since the CEM recognized the Youth policy and other related legislation for young people as a tool to improve the overall position of young people. Center for youth education has decided to concentrate one of the strategic objectives on advocacy, the creation and promotion of documents, strategies and legal regulations for youths. How to plan and run advocacy and lobbying campaign _________________________________________________________________________ „I have participated at the workshops named „Be the change, advocate!“ with the CEM. They showed us our rights and our possibilities and how to possibly achieve these rights. Honestly, I have never been in contact with these things. Everybody says that Roma people have their rights and that children have to go to school but this is the first time that somebody has explained what to do and how to do that. Children must and should go to school, they sholud achieve something in their life so that they can later help the Roma population. When the codex of good practice is signed, some of the Roma children will became the possibility to participate in the life of the community and be equal with all children in Bosnia and Herzegovina. It should be more projects like this so that all Roma children have the possibility to go to school.“ - A.Dz. – volonteer Travnik __________________________________________________________________________ Center for youth education (CEM) is the largest non-governmental youth organization in Central Bosnia. The CEM has its headquarter in Travnik, and in this region it has been operating since 1998. The organization was first called the PRONI Institute of Social Education, and later it has been renamed to the Forum Syd Central Project Bosnia. From the first of December 2007, the CEM operates as an independent, non-governmental organization. Since the beginning of its existence, the CEM operates with planned, systematic and professional work with youth, toward individual and community development. The Center for youth education has gained a very long experience in working with young people and carrying out youth work, which includes programs and activities based on the methods and principles of non-formal education. The CEM works on the process to empower and support for young people so they can become aware, responsible and active members of the community. The CEM also creates the conditions for realizing full potential of youth. The CEM works at three levels: the education of future youth workers, supporting the development of youth policies at national and local level and the practical work with young people (youth work). The organization works in accordance with European standards, using methods based on a 30-year experience of professional youth work in Northern Ireland, as well as the 14-year personal experience. The Center for youth education employs educated people with expert knowledge in the field of youth work, system planning, project management, marketing, finance, etc. The CEM uses internal and external experience to build a team that works to meet the strategic directions of the organizations, vision and mission. The Center for youth education enjoys support of municipalities in which it operates, as well as by the donors and partners, and institutions such as the Ministry of Education, Sports, Science and Culture of CB and the Sarajevo Canton, Youth Commission of Travnik and other educational institutions. “Youth without parents - Better future for them!” ...................................................................................... Context Problem in this campaign are children’s without parents care. Youth without parental care upon finishing the high school end up on the street. By law they cannot stay in the Home for Abandoned Children after they turn 18. If they do not find the job, they will not find a place to live, nor will they have basic conditions for life. The worst of it is the fact that they do not have any advantage in employment. The problem is in the Law on Employment: (Zakon o zapošljavanju i pravima za vrijeme nezaposlenosti – “Službeni glasnik Brčko distrikta BiH” broj 17/08; and ZAKON O POSREDOVANJU U ZAPOŠLJAVANJU I SOCIJALNOJ SIGURNOSTI NEZAPOSLENIH OSOBA “Službene novine Federacije BiH” Godina VIII-Broj 41) This category, youth without parental care, is not specially treated, i.e. it does not have the advantage in employment. We want through this project to influence the governments in two cities, one in the Federation of B&H, in Tuzla and Brčko district B&H, to start the adoption process of regulative, which would give possible advantage in employment to the youth without parental care. Interventions undertaken and results achieved A plan for this action was to adapt the legal act (regulative) in Law on Employment in which would be clearly stated the advantage of youth without parental care when applying for a job position. It also considers the raising awareness of competent organs of local government about needs of youth without parental care and raising awareness of citizens about the problems of youth without parental care. Step that was organized: Public forums/ debates in Brcko district and Tuzla. Public forums was held, one in Tuzla and one in Brcko district , where the discussion was with citizens about the problem. Representatives was also people from different institutions: The Centre for Social Work, Department of Employment, Municipality and Home for Abandoned Children will be invited to the forums. The topic of these forums was the problem of the youth without parental care after finishing the high school. These forums have for an aim to raise the awareness of citizens about the problem. Petition in Brcko district and Tuzla A petition is going to be prepared what the citizens will put their signatures on it, and which is going to be sent to the competent officials in municipalities so as to create the conditions for adoption of regulative on employment of youth without parental care. Meetings with the decision makers in Tuzla and Brcko district Meetings with the Social Work Centre representatives, municipal representatives and representatives of the Department of Employment. The initiative has been made for the adoption of regulative in the Law on Employment. 10 young people without parental care from Tuzla and 10 young people without parental care from Brcko district were employed. Activities that were projected in campaign "Better future for them" are two meetings with relevant institutions. One was held in Brcko and the other in Tuzla. After meeting with representatives of the institutions related to the problem of campaign, was organized press conference, in order to meet the general public with the project. After the press conference was organized a round table - discussion on topic "Improving the employment perspective of young people without parental care". The participants were representatives of the Centre for Social Work in Brcko and the Institute for Employment, then guests from Tuzla, the Centre for Social Work Tuzla, Orphanage Tuzla, as well as the Institute for Employment Tuzla and the CSOs Tuzla. During the discussion, we came up to the another conclusion, where such group of young people “youth without parent care” are faced with many other problems, not only employment, but we believe the key is employment decision and it will be a good start to their independent lifes. Main challenges and tips for future actions When it comes to the evaluation of the results of our actions, it is necessary to highlight that the results are very satisfactory. So, it has been done twith professional attitude, manners and well-designed campaign in order to convey our message and thus unite the NGOvolunteers, citizens of Tuzla and Brcko district and relevant institutions in Tuzla and Brcko, and of course - the media. All of the above have recognized this project and its idea as something positive and something worth fighting for. Therefore, all of them contributed actively in this campaign participation. The goal of the campaign was to start the process of adoption of legal regulations in the Employment Act, which shall be clearly expressed with the preference in hiring young people without parental care. Given that all of the above has been recognized, and our idea and supported it fulfilled, we believe that the competent bodies for the adoption of a comprehension will react positively to the posted request. After the survey there was organized roundtable. There were 18 participants from NGOs, young people from the local community and representatives of the Employment Bureau, Government Division for technical and administrative support jobs and citizens' associations, CSOs, local communities and officer for youth in Brcko distrikt. There is produced a results of the survey and its opened discussion on the subject, to overcome the current problem. Also there is publicad politics document â&#x20AC;&#x153;Improved information flow to young people in rural areas regarding employment problemâ&#x20AC;? and the document has been delivered to the representative of the government in form of a request to improve information flow to young people in rural areas which the title of the document says itself. The three most repeated suggestions of finding solution were: web page that includes all the important information related to employment, the introduction of the Internet in the rooms, print classifies with essential information for youth. A common suggestion was also to raise the awareness of the opportunities for selfemployment. â&#x20AC;&#x153;Limited is the one with prejudiceâ&#x20AC;? ...................................................................................... Context Law on professional rehabilitation, training and employment of persons with disabilities in the Federation of B&H, more than five years was in the Parliamentary procedure and waiting for adoption. In February 2010, whatever was finally adopted, and as a result, in March of this year, a fund was established as a key mechanism through which to address the systemic problems of training and employment of persons with disabilities in the Federation of B&H. Because of these steps, the public is poorly informed, and that we have learned through this analysis, we will try to approach this issue and that anyone interested in this case to employers, people with disabilities and others. Vocational rehabilitation, training and employment of young people with disabilities is of particular public interest, and is in the field of social protection. Promoting the rights of persons with special needs would conduct the campaign through street and a round table. Intervention undertaken and results achieved The campaign is designed as a quarterly activity to promote the employment of people with disabilities and for this purpose will be conceptually designed specific brochures, posters and radio-spots. The activity consists of a street campaign in Gradacac and Brcko District. Volunteers will share advertising material and meet employers in these two municipalities. In addition, distribution of the promotional material and posters will be placed at the key locations in these cities. Also, it will be organized two round tables that will meet employers, people with disabilities and other stakeholders. The aim of the campaign is to raise the awareness of employers and the general public about the opportunities and abilities of persons with disabilities that will get them the opportunity to participate equally in the labor market. Main objective of the campaign: To introduce the target group about their rights and potential employers as well as the local community Expected results: Promotion of employers who employ people with disabilities want to show a good business practice, which allows the individuals with disabilities equal access to economic opportunities, and perceiving the media campaign to highlight positive examples, but at the same time the general public aware of the existence of discrimination in employment of persons with disabilities. Target Group: Able-bodied, but unemployed young people with special needs (disabilities), employers and the local population. Familiar target group of their rights and potential employers as well as the local community. During the implementation of all planned activities are successfully implemented. A street campaign was held, where were distributed a promotional material in Gradacac and Brcko district B&H. Besides the mentioned street campaign, the promotional material was distributed to the legal entities too. Promoting and meeting the population of the project went through the radio broadcast which were held on local radio stations as well as posted at the Web portal (www.kult-gradacac.org). How to plan and run advocacy and lobbying campaign In addition, there was held a round table on the topic „Employment of Persons with disabilities“ which was attended by all relevant factors who are essential to solve this problem. The final activity was to conduct a survey of the population of the municipality Gradacac and Brcko distriikt upon knowing the problems of people with disabilities. The round table was attended by 22 participants as it was anticipated. In this way the target group projects set to their rights, as well as potential employers and the local community, and thereby fulfilled the main objective of the project. The specific objective of the campaign is filled with promoting good practice of employers who employ people with disabilities and by handing out leaflets on the street action through raising the awareness of employers and the general public about the features and capabilities of people with disabilities to participate equally in the labor market. In addition, through a media campaign, we highlight positive examples of employment of people with disabilities, and at the same time introduced the general public to the existence of discrimination in the employment of people with disabilities. Main challenges and tips for future actions The main challenges we encountered during the implementation of the campaign is the lack of information and lack of interest of the local population and authorities for this problems. „ALTYO project has helped to improve the skills of activist of the Youth center "Vermont" through series of educational training related to the advocacy and lobbying, writing, and high-quality implementation of many projects. Conduction of the campaign "Restricted is the one with prejudice" as well as the implementation of future campaigns will be easier, because participating at the ALTYO training has expand our knowledge and experiences in a large segment, by sharing it with other organizations. Also representative of medias, in this case Radio Brcko has emphasised the importance of our project „Restricted is the one with prejudice" and with positive comments supported our work and devotion that someone cares about this very vulnerable category of children and youth. We get a lot of support the citizens of the District, which we included in the project and by the employers to whom we provided promotional materials.” - Marina Lucic, employed of Vermont __________________________________________________________________________ The Association KULT Gradačac is a nongovernmental organisation founded in 2004 with the goal of encouraging and development of youth sector. The Association satisfies social needs of youth through various educative programmes and cultural, entertaining and sport events in cooperation and partnership with local and international organisations and local government. The KULT Association Gradačac organises various events aiming for the youth to participate actively within their local community. Besides the mentioned, in these events and education, young people spend their free time more effectively and gain new perceptions about their future. The KULT Association Gradačac also deals with youth politics. The Youth Center Vermont Brcko is an independent, non-governmental and non-profit association of citizens that their activities and helps contribute to improving the position of young people in social, economic, humanitarian, cultural, sports, technology and other fields, based on democratic principles and non-partisan. In its work, the NGO Vermont has had a successful collaboration with the local authorities as well as all international organizations operating in the Brcko District of BiH and beyond. The aims of the Vermont center are: - Affirmation of young people and their engagement in society, - The protection and promotion of the rights of children and young people, - Cooperation with national and international associations and organizations, - The achievement of cooperation with local authorities, - The involvement of young people in the decision making process, and - Devising constructive free time. During the eighteen years of successful work in our centre has shown that it can cope with all the challenges and problems that modern times in which we live carry out. Our aim is not only to maintain the continuity of our work, through many other activities improve and bring our work to a great height. “Say NO to unemployment and discrimination of young women in the labor” ...................................................................................... Context There was conducted a study on the subject “Unemployment and discrimination of young women in the labor”. Based on the interview at the employment office and the meeting focus groups as well as the data collected through the questionnaire, there was an idea to deal with this issue as a problem in B&H. The idea of this project is to create supportive atmosphere in order to decrease level of unemployment of young women in municipalities of Maglaj and Zivinice. This is going to be done through promoting existing laws and lobbying strategies relevant stakeholders to implement these laws and strategies and to raise awareness about issues related to unemployment of young women at the local level. Intervention achieved and results achieved Campaign was organized on promotion of existing laws and strategies, promotion of Employment strategy of the B&H for 2009. – 2013 and the Labor Law of the B&H, as well as the existing local Employment strategies. This activity will be implemented through the whole project implementation period. 2500 flayers and 6 banners planed to be used as promotion tools in this campaign. The round table “Representation of young women in labor market” was anticipated to be held. After the round table, there was planed meetings with the relevant stakeholders – in order to lobby enhancement of implementation for existing law and strategies (local authorities), As well as to encourage relevant organizations to advocate for this issue and to promote importance of equal possibilities (business sector). Round table “What to do next” – was implemented in order to introduce all relevant parties with achievement of this project and to create guidelines for future actions related to employment of young women. Aim of this campaign was; - Create supportive atmosphere to decrease level of unemployment among young women at local level. Objectives; - To lobby relevant stakeholders to implement existing laws and strategies related to employment of young women. - To promote exiting laws and strategies related to employment of young women - Raising awareness about issues related to unemployment of young women Target group of this project are young women age of 18 to 30, who are able to work in the area of municipalities of Maglaj and Zivinice. PR campaign This activity included a promotion of whole campaign as well as promotion of existing laws and strategies related to unemployment of young women, raising awareness on issues related to unemployment of young women and promotion of issues targeted by project. This was done through the issuinig of the promotional posters, flyers, radio and TV broadcasting. The campaign started with posters and flyer booth. The purpose was to get the attention of public and raise awareness on issue that this project was promoting. It is necessary to say that this activity has resulted in success because people were not only taking flyers but were also spending some time with us, on booth to talk about whole campaign, and the issue that this project was promoting. TV and radio broadcast resulted in same way, again people were very interested in this campaign, which was shown through many phone calls we received. People have shown support and were very delighted with someone who was talking about this issue and taking action. unemployment of young women were discussed there. Since this was the first time that (students) organized a round table, it was a great pleasure, especially it came up with success and the feedbacks of the participants were very encouraging. At the end of the round table conclusion was made and many suggestions were been given by the participants, on how to continue our advocacy campaign in order to make this campaign more successful and continuous. Main challenges and tips for future actions Maybe the biggest challenge and the biggest fear was how to effectively encourage local government to show support and cooperation when dealing with the issue this project was promoting but the local government showed high interest in this issue. Even, without the financial support from EU it has been planed to continue the campaign with the own funds, because, as stated above, general public and local government showed high interest in this problem. 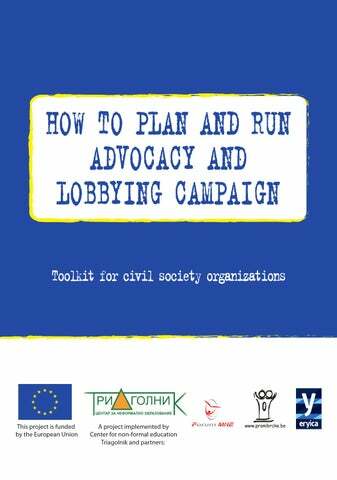 How to plan and run advocacy and lobbying campaign Generaly, it succeeded to achieve all set up goals, aims and objectives. Feedback from general public was more than enough to realize that the awareness about this issue has been highly raised. Since this is an election year, many political parties included some of the elements of the project into their election campaign. Therefore, it has been clear that the issue of high rate of unemployment was recognized among local government and political parties. There also has been given a great support from local government and an offer of their help in dealing with the issue which this project was promoting. - Ismet Karabegovic, General manager __________________________________________________________________________ CORNO - Center for youth work and no formal education work with young people began in March 2000, as a part of the international organization The "PRONI institute for Social Education" in Eastern Europe. In June of 2005, we became a part of Sweden NGO Forum Syd, who helped to develop the further program and to create the Citizens Association CORNO. Since October 2007, The Association of Citizens CORNO has taken all actions and responsibility for the program. Vision: Trained, responsible young people are active members of society, which recognizes them as a potential answer to their needs. Mission: The CORNO is a nonprofit association/organizations, which, using the knowledge, experience and best practices of youth work and informal education, empowers young people to develop their potential through active participation in the development community. Also, it works on the development of policies and strategies, advocating for youth, capacity building of civil society in Bosnia and Herzegovina, with a focus on rural areas. Cooperate with youth, national and international organizations, national institutions, governments at all levels and local communities. We have three areas of action: -Youth work - Education - Youth policy EU "Jezero" was formed in 2004 at the initiative of several young men who wanted to do something useful, in order to change a very bad situation, which included population that gravitates to Lake Modrac. In this area live more than 20.000 inhabitants. At that time there was no organized waste transport, the rivers were buried to various waste, wild dumps were everywhere around. Young people did not have any activities and were "isolated" in a small space without enough information and contacts The objectives of the association (according to Statute): - Protection of drinking water sources, - Protection of rivers, lakes and organized cleaning, - Protection of air from all forms of air pollution, - Protection of flora and fauna, - The fight against drinking and selling environmentally polluted and unhealthy food and beverages, - Work on all other areas that in other ways threaten the healthy and clean ecological environment. In addition, all of our activities are aimed to achieve sustainable development of our local community. Vision: the EU "Jezero" is distinctive, non-governmental organization that contributes to the sustainable development of communities, with the active participation of citizens and with the high respect to the principles of democracy and human rights. MISSION: The Ecological Association Jezero is an NGO that works through the various forms of education, action planning and environmental cleaning, organizing youth camps environmental impact on raising environmental awareness at entire population, with special emphasis on youth. EU â&#x20AC;&#x153;Jezeroâ&#x20AC;? operates in the area of Ĺ˝ivinice Bosnia and Herzegovina and their work gives full contribution to sustainable development, environmental protection and improvement of living conditions in the local community and region. "Lobby to employment for young people from the countryside" ……………………………………………………………………………………………………. Target group: Young people from rural areas Organizations in charge: NGO Kompas and NGO Da zazivi selo Responsible people: Mladen Zorić, Slavica Mrdak, Dajna Marinković, Miranda Marinković Description of the action: This idea is based on the employment of young people from rural areas through public work, to obtain the NGO "Better life for a countryside" from Pljevlja and NGO "Compass" from Kotor in the Bureau work in Kotor and the Bureau work in Pljevlja. Young people from rural areas are not represented in the law as a vulnerable group, which is difficult for all organizations involved in improving their living conditions. With this action we will work together to approve the work of the Public Employment Bureau of Montenegro in order to employ young people from rural areas. As part of this action, educative courses will be held in order to inform and encourage young people to be proactive and self confident. The campaign has a promotional part (creating and distributing info brochures for both target group and stakeholders). Description of the action: The campaign aims to create opportunities for employment of young woman in Montenegro. With this action the work is delivered in order to improve the work of the Public Employment Bureau of Montenegro as well as business sector to create policies and to employ young woman especially taking into consideration the young mothers raising their children by their own. As part of this action, educative courses will be held in order to inform and encourage young woman to be proactive and self confident. The campaign has a promotional part (creating and distributing info brochures for both target group and stakeholders).